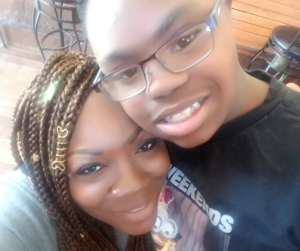 The following story is one of many in support of passing the Down Syndrome Protection Act (House Bill 2050 & Senate Bill 1050) because Down syndrome is a life worth living. To any woman that is faced with a prenatal diagnosis of Down syndrome, may I share with you my experience of having my child with Down syndrome be the absolute best thing that’s ever happened to me. He is an awesome human being and beyond. No matter what kind of stresses went on in my day, I know that when I see Devin, from the moment he says, “Hello, how are you?” “Hug?” everything is as it should be. Let me tell you, you don’t know the meaning of unconditional love until these incredible beings are born. What I want parents, grandparents, other children, the community and people all across the world to know is that Down Syndrome is a developmental disability, not a disease, nothing to be afraid of or isolated from. DS is a part of their being but does not define them, their abilities, nor their hopes and dreams. My child loves to dance, attend school, cook, swim, ride horses, play sports, listen to pop music, especially Michael Jackson, and blushes when he hears the name of girls he likes..Rachel..Beyonce. He tries to look at things he shouldn’t over the internet, pretends to be sick to avoid going somewhere, laying down the law with his other siblings…the full gamut…you name it. He has more in common with a typical teenager than any differences. I don’t know how far my child will go in this world but he is HERE, and he will determine that and momma bear along with educators and advocates will help to sculpt and foster his future. He will try many new things, and succeed at most. He will work hard in school and at his job. I know that the possibilities are endless. He will be who he is intended to be and more than you imagined. It may be hard for parents when first confronted with the diagnosis because you think about how cruel the world can be and you feel a loss in what you dreamed them to be. You are temporarily blinded by fear. You can’t forecast what your child with DS can do or who they can be, but you wait, they will eagerly show you and with a smile on their face. They have personalities, determination, and they’re fearless so don’t limit them. What’s the recipe for that vision board to come to fruition? Early intervention, education, opportunity, and some love. These are some of the things that will help our children to give breathe to their dreams. Why me? Why was I chosen? I don’t know, but I thank God that I was. How did I get so lucky! Pennsylvania’s Down Syndrome Protection Act would prohibit an abortion of any child solely due to a diagnosis of possible Down syndrome. Estimates show at least 67 percent of families in the United States when given a prenatal diagnosis of Down syndrome choose to abort the baby. And families right here in Pennsylvania have been pressured by medical professionals to have an abortion when given this diagnosis.